Apparently, the appointment will be formally announced tomorrow... but already, reaction's beginning to emerge on B16's expected choice of Bishop Kurt Koch of Basel -- until last year, president of the Swiss bishops -- as the Vatican's next chief ecumenist at the helm of the Pontifical Council for Promoting Christian Unity and, indeed, the lead hand on the global church's relations with the Jewish community. 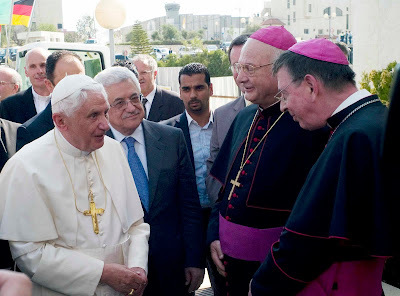 Shown above (right) with the Pope during the latter's 2008 pilgrimage to the Holy Land, the 60 year-old prelate will bring a contrast of style from his soon-to-be predecessor, the colorful Cardinal Walter Kasper, who won high marks among the dialogue partners, yet famously tussled with the now-pontiff shortly after his arrival in Rome over the primacy of the universal church versus that of the local churches. A native of the diocese he's led since 1996 -- and a longtime member of the dicastery he's tipped to head -- Italian reports have already circulated quotes from Koch saying, in essence, that accusations of B16's desire to "retreat" from the legacy of the Second Vatican Council are the result of "ignorance, or a willful intention of some theologians who would know better, but loudly say otherwise" (an alleged reference to interventions on the issue made by Fr Hans Kung). Benedict, the nominee added, "absolutely doesn't want to go 'backward,' but wants instead to bring the church into the deep... pressing forward even today for a new 'reformation' of the church from within, and thus to restore its authentic form, already realized in the Council." "We rejoice at the appointment of Bishop Kurt Koch as president of the Pontifical Council for Promoting Christian Unity", said Tveit commenting the news in Moscow. "We welcome his appointment and look forward to working with him for the visible unity of the church", he added. Tveit said that "Bishop Koch is well known for his openness and deep ecumenical commitment. His book 'That all may be one; Ecumenical perspectives' is an excellent summary of the present state of ecumenical dialogue and relations". "We see in Bishop Koch a reliable partner for all those involved in the ecumenical movement and trust he will continue Cardinal Walter Kasper's emphasis on spiritual ecumenism", Tveit said. "Bishop Koch has been given a very important responsibility as the call for all Christians to be one comes from Jesus Christ himself", Tveit said. "I wish him much joy in fulfilling this calling, and that God may give him strength."